≪Plain Cactus≫, referring to the characteristic habitat of the genus, the Great Plains of the United States. A genus of small low growing plants, subglobose to cylindrical, solitary or caespitose, not ribbed but tuberculate with the apex depressed. Spines hiding the epidermis, variable in number, radial sometimes pectinate; central spines straight or curved, aciculate, setose or suberous according to species. Flowers diurnal, remaining open during night, self-sterile, apical, with a short floral tube, bell-shaped, whitish, yellow or pale pink to intense magenta, pollinated by bumblebees (Bombus spp. ), other hymenoptera and moths of the Sphingideae family. Fruits globose to cylindrical, naked or with some scales, with a longitudinal dehiscence when ripe, eventually opening at the top like a lid. 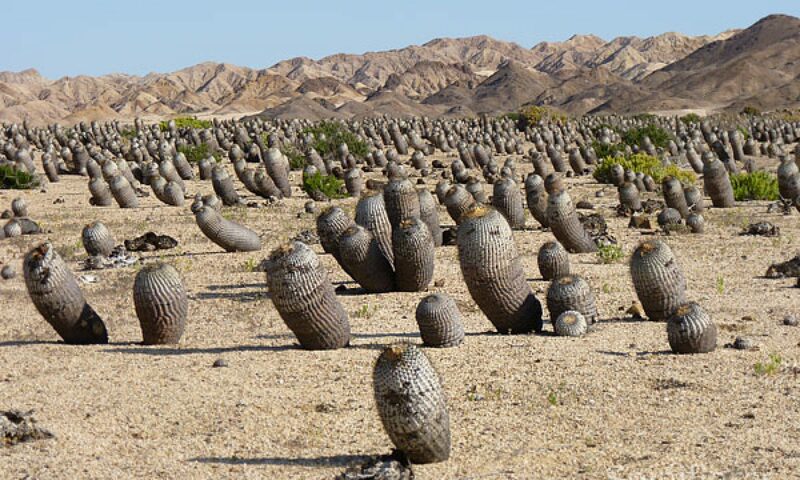 Seeds obovoid to pear-shaped, wrinkled or papillose, blackish brown, dispersal myrmecophilous. 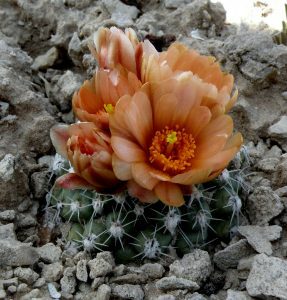 The genus Pediocactus grows endemically in the United States, mainly on high-plateaus, high desert plains, on rather mineral light soils, powdery, gravelly, even slate, limestone or gypsum, also in woodlands of pinyon pines and juniper trees, grasslands, on rocky, gravelly, alluvial calcareous soils, sometimes of volcanic origin (P. peeblesianus subsp. fickelsenianus, pers. obs. 1992), in cracks of rocks, in very small localized colonies, from 400 m (P. nigrispinus) up to 3300 m in altitude. Species are typically found in extremely cold regions in winter and undergoing significant diurnal and nocturnal temperature ranges (nycthemeral amplitude, or difference of temperature between day and night). P. simpsonii can withstand temperatures down to -26°C. USA (Arizona, Colorado, Idaho, Montana, Nevada, New Mexico, Oregon, South Dakota, Utah, Washington, Wyoming).